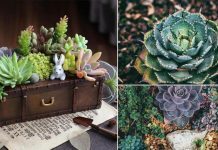 If you’ve got clump-forming succulent plants, this informative guide on “How to Re-pot Aloe Plants” will help you in dividing, propagating, and repotting them! There is more to growing the aloes than just keeping them in bright light. Transplanting at the correct time is equally necessary. Aloes that get heavy on the top, produce lots of offshoots and adopt a leaning habitat are eligible for re-potting. What is the Best Time for Re-Pot? By the rule of thumb, you should wait till the ‘pups’ (offshoots) become 4-5 inches long, or at least one-fifth the main plant’s size. They should also have at least three to five leaves of their own to synthesize plant sugars for survival. Immature pups don’t take well to the rigors of re-potting and perish. Take out the plant gently from the pot and examine its root system. Keep inspecting till you find the sites of attachment between the mother plant and the offsets. That knotted network of thick roots is your target. What you’ve to do is separate out individual ‘baby’ plants by cutting out their corresponding roots, while ensuring that each of the transplants retains a small portion of the root. Shake off the dust and dirt and start digging plants from the matted mass. 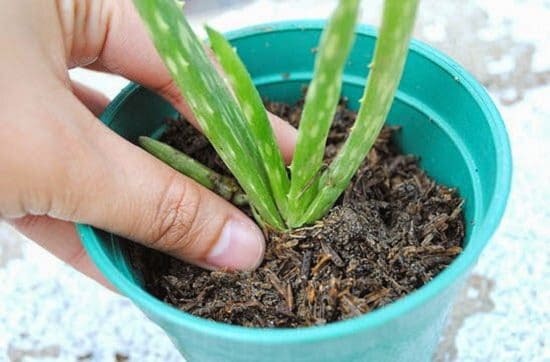 If your aloe plant is well established and old, assume it to be root-bound. In that case, don’t hesitate to use a clean knife on it. You’ll have to use a trowel as well to get to the spot where you can begin separating the offshoots. The baby plants will vary in size. After freeing them up from the mother plant, wipe out the dirt from the stems. They might release some gel, but that’s fine. In the end, you’ll have the mother plant left alone, which can be replanted somewhere or just repot it in the previous container. Before replanting you can leave the roots to heal in a bright and dry spot for a couple of days, this process will protect the plants from getting infected with the disease (this step is optional). 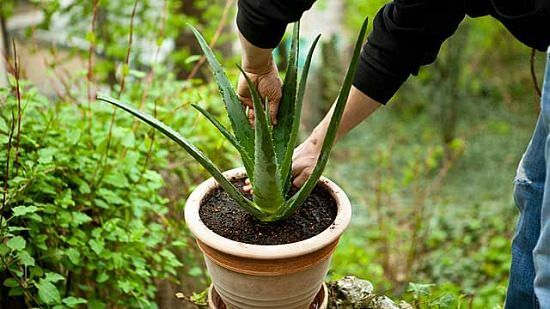 Smaller, two-three aloe plants can be planted together in five inches pots. Choose commercial potting mix available for succulents. 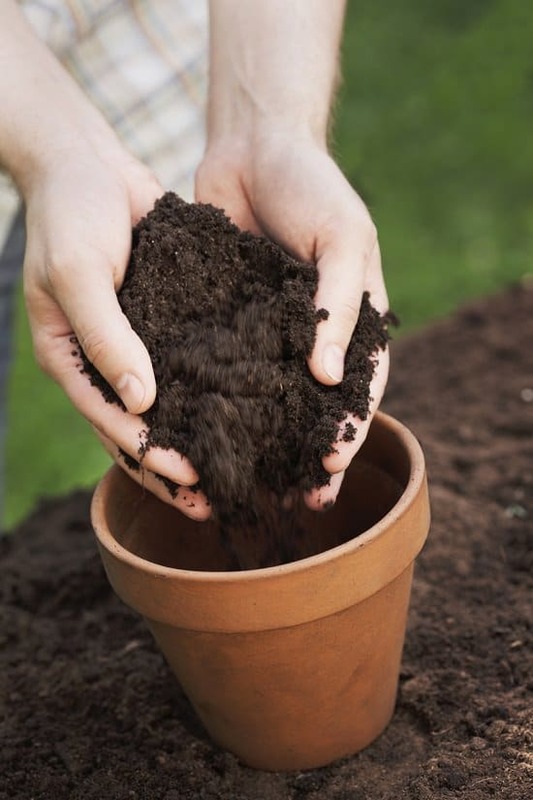 Also, adding extra sand or perlite to the soil is a good idea, especially when you’re using a standard potting soil. 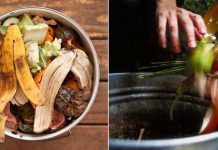 Using both hands, work the plants into the prepared containers, either placing them centrally if single or spacing them out equally, if multiple. Add more soil to cover the crown and firm it up using your hands or trowel to seal air pockets. As soon as you have planted them, keep the newly potted plants in a spot that is shady and receives gentle sun to give them their time to recover for a couple of weeks. Established aloe plants can be kept in the full sun. Don’t water the plants for a couple of days after planting and then give them a good soak. After that, water sparingly, once in 2-3 weeks. However, in tropics, you can water once in a week. 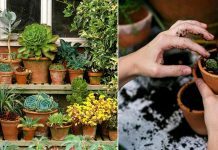 Next article12 Great Tips For Starting A Kitchen Garden Every Beginner Should Know! My aloe is rather old, fairly large, but it has never had babies. I transplanted it to a larger pot last year so it has plenty of room. Can you tell me why there are no off spring?. People coming into our office are always trying to prune my plants…the aloe they uproot pulling the dry tips or dead leaves off. Next thing I know I have plants just laying on top of the soil where they have pulled them out of the soil n not said anything about it. I had a large pot full but now just only 5 left and 3 of them. The aloe plant on our front porch has gotten so big and menacing I’ve put off repotting it for more than a year. Hopefully this tutorial will give me the courage to tackle that monster. I should have enough new plants for every one on this block!